Crafter, Baker, Cute Baby Maker! 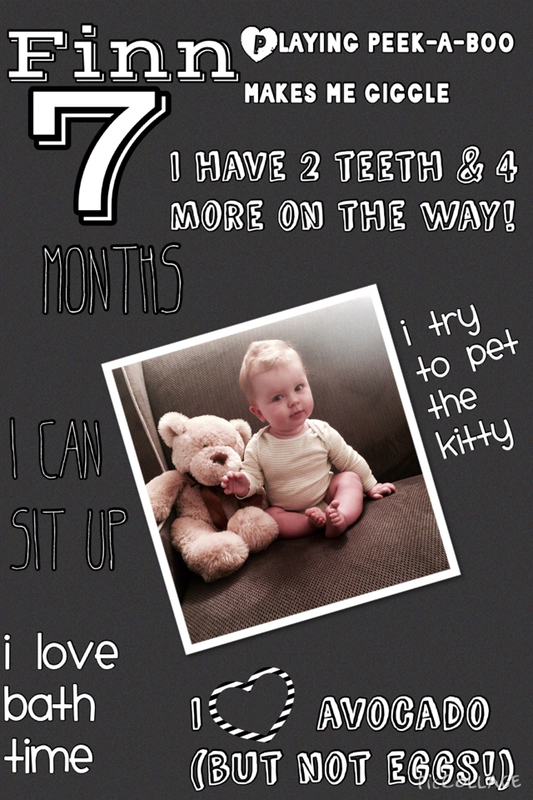 I can’t believe my baby is 7 months old, time is going by way too fast! After going back to work three months ago I feel like everything is happening at warp speed now and his first birthday will be here before we know it!. He still (mostly) sleeps through the night, although the last couple of weeks he’s been waking up at least once every night, most likely due to his four top teeth which are coming in all at once. He is our curious little man who never stops moving, grabbing, and wriggling. We will definitely have our hands full when he figures out how to crawl! 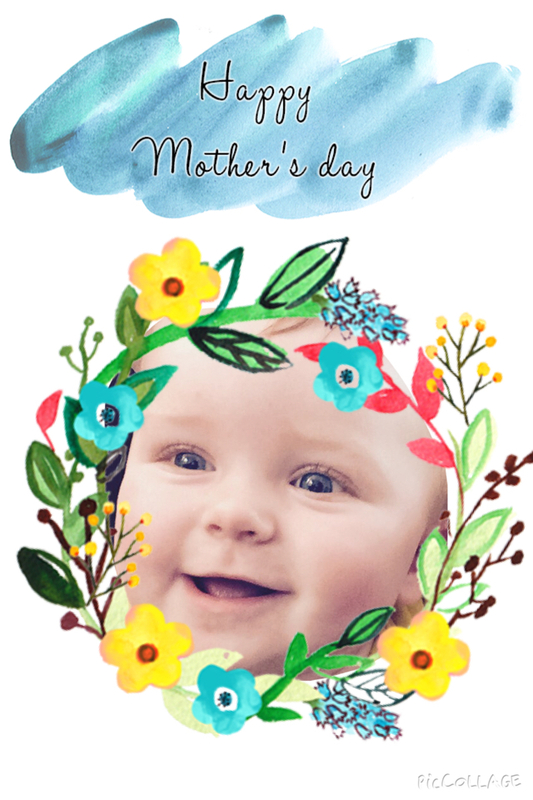 This weekend I got to celebrate my first ever Mother’s Day thanks to this sweet little face. It was a fun filled (yet exhausting) weekend. On Saturday night my parents came to visit and we celebrated my wonderful father’s birthday with a nice dinner out. Lots of fantastic food, wine and the most delicous pomegranate and thai basil riblets! We burned off brunch by wandering around the farmers market where we picked up some of the sweetest cherries. A stop in to the local toyshop was also in order, where Finn was spoiled by his grandparents with some new wooden teeters/ toys including this combo pacifier clip/teether by Haba. And while this mama could have really used an afternoon nap, Finn is getting is next set of teeth in and we are in full on teething mode (again). Which means lots of interrupted sleep, putting everything in his mouth, and of course boycotting naps. This round seems to be taking a much harder toll on the little guy than the last one, but they started to poke though last night so there’s an end in sight (at least for now). Hope all the beautiful mama’s out there had an amazing day! 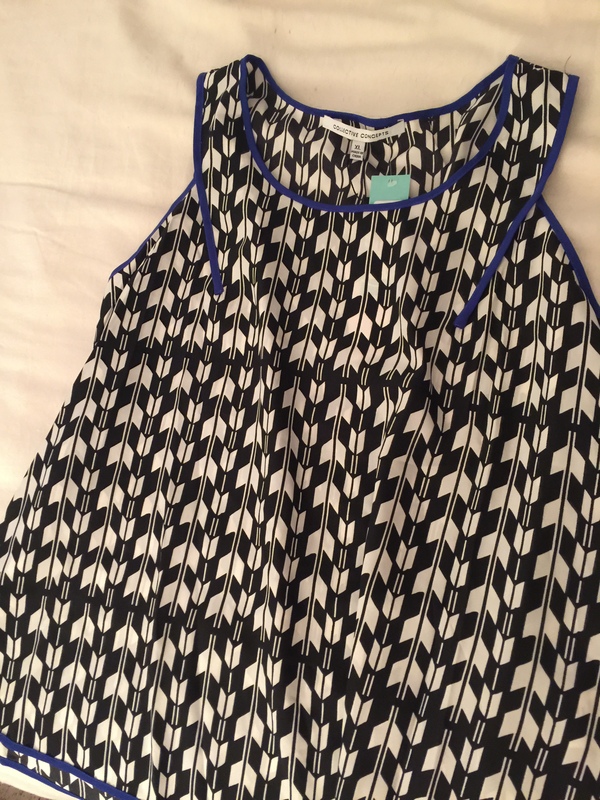 I have a sneaking suspicion we are in for a hot summer here, a short tank dress is a fun casual alternative to a long maxi (which I love too). I have been eyeballing totes for days Finn and I need to run out the door for a few quick errands and I don’t want to deal with a big ol’ diaper bag, this rose gold color is just gorgeous! Also how cute are those fringed sandals? Finn had one of these Old Navy rompers last year and I definitely can’t wait to get him some more (I love that they added a little hood to this year’s design). Our weekends always seem to fill up fast these days. Saturday I managed to get some much needed cleaning and organizing done, but as these things go, one thing leads to another and you start rearranging your dining room and it sparks a full on redecorating project (although truth be told I think this one’s been brewing for a while). Not only does the current set up and flow of the room no longer work (since we finally got a dining room table), but a few months ago in an attempt to add color to our “bland” townhouse I went nuts with an aqua colored fabric which of course, I now can’t stand. 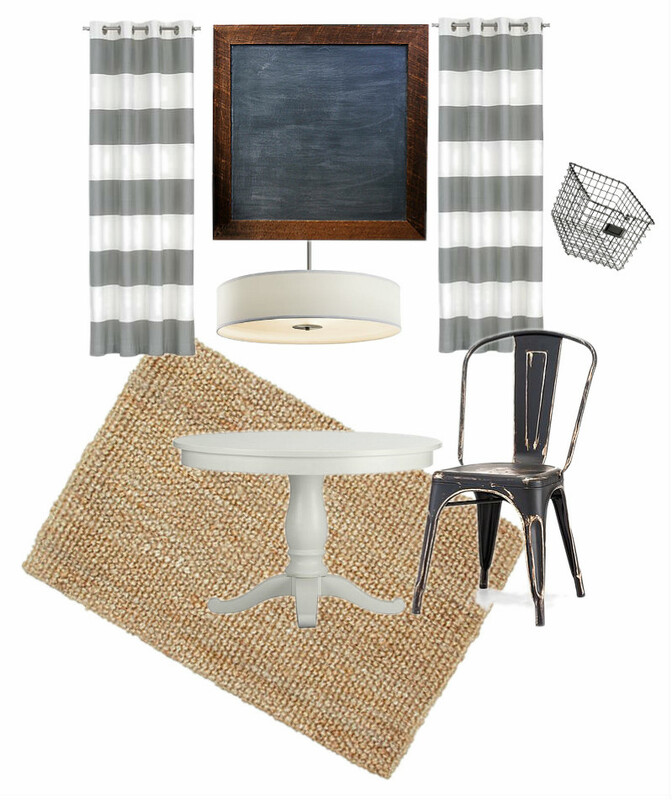 I am starting to come to terms with the fact that while I do love color, I prefer a more neutral living space. Of course there will be some painting and sewing projects thrown into the mix too. Stay tuned for updates! 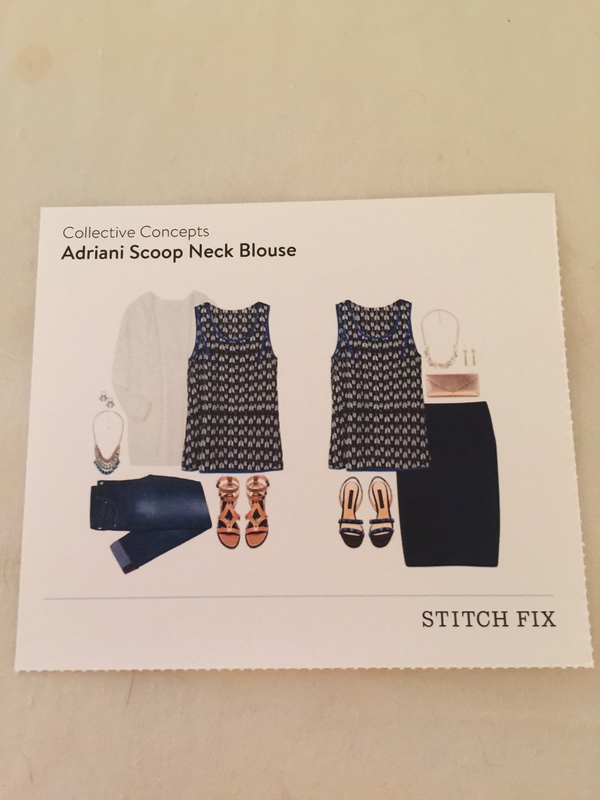 If you haven’t heard by now, Stitch Fix is a personal styling service. 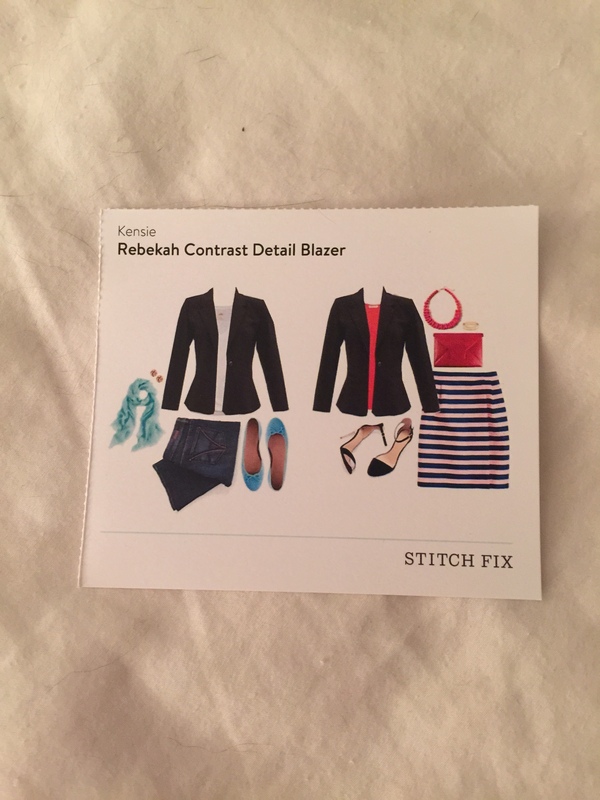 You fill out an online profile, pay a $20 styling fee (which can be applied towards any item you decide to keep) and your stylist sends you 5 items along with cute little styling cards. You get to try on the items in the comfort of your own home and send back what you don’t want. If you keep everything you get a 25% discount. 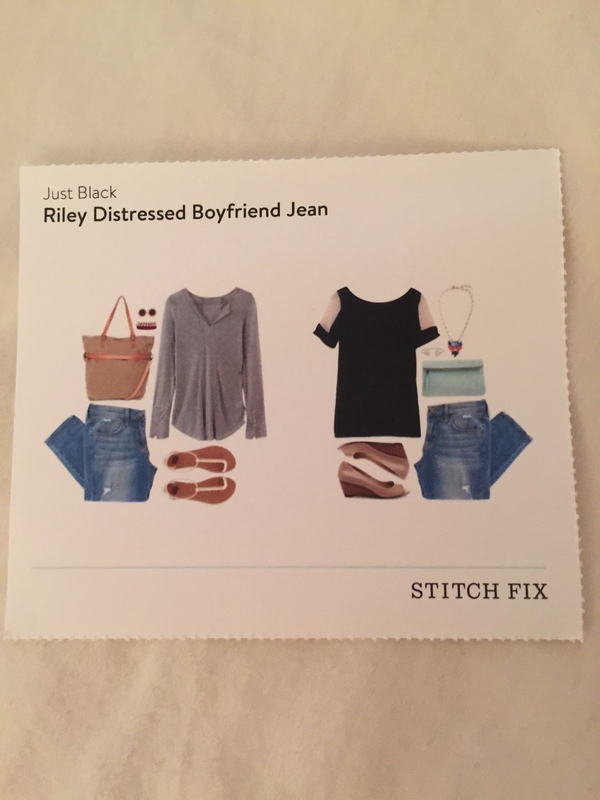 I actually never thought I would join a service like Stitch Fix. I know my own style, have always enjoyed following trends and I love SHOPPING. Then I had baby Finn, and not only is it a struggle to get out the door some days, but trying to wedge yourself in a dressing room with an infant in a stroller who is trying to grab everything while you try on clothes, makes clothes shopping a beast! 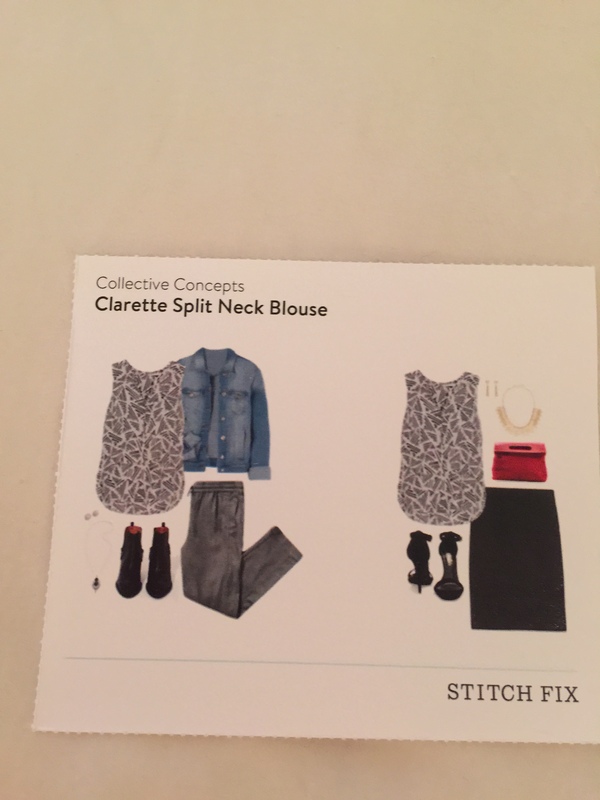 Now that I desperately need clothes to fit my post baby body, it was the perfect time to give Stitch Fix a go. Upon my sneak peek I was skeptical of this blouse. 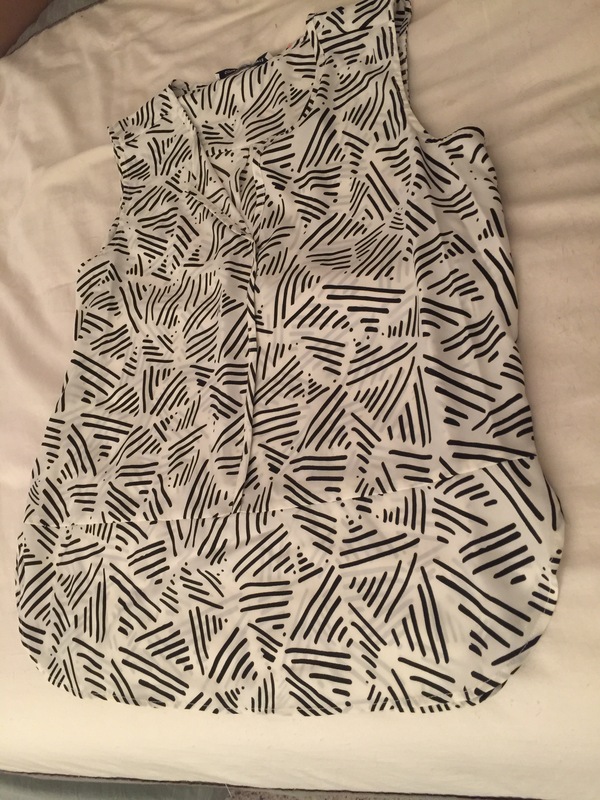 But as soon as I took it out of the box I fell it love with the pattern (doesn’t it look like arrows?) I also loved the tiny pop of color with the cobalt blue detailing. 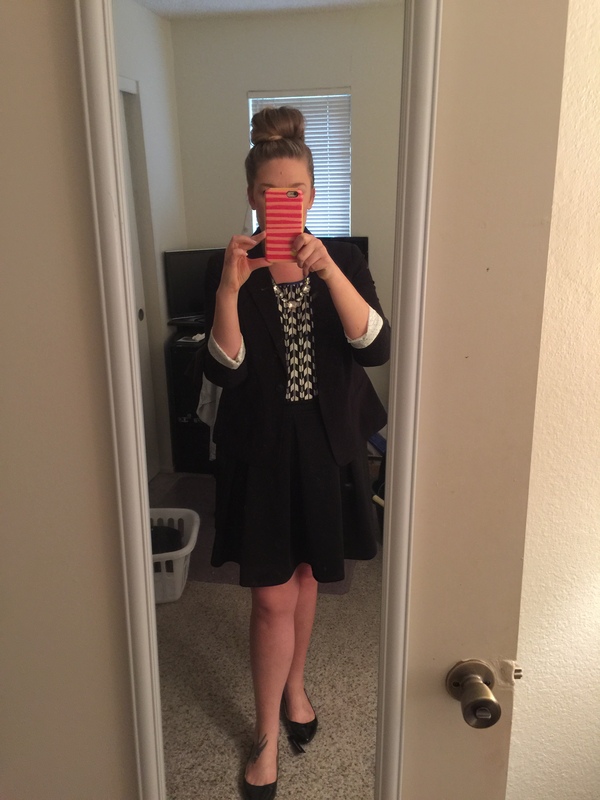 Bonus: it is an easy piece to dress up or down. 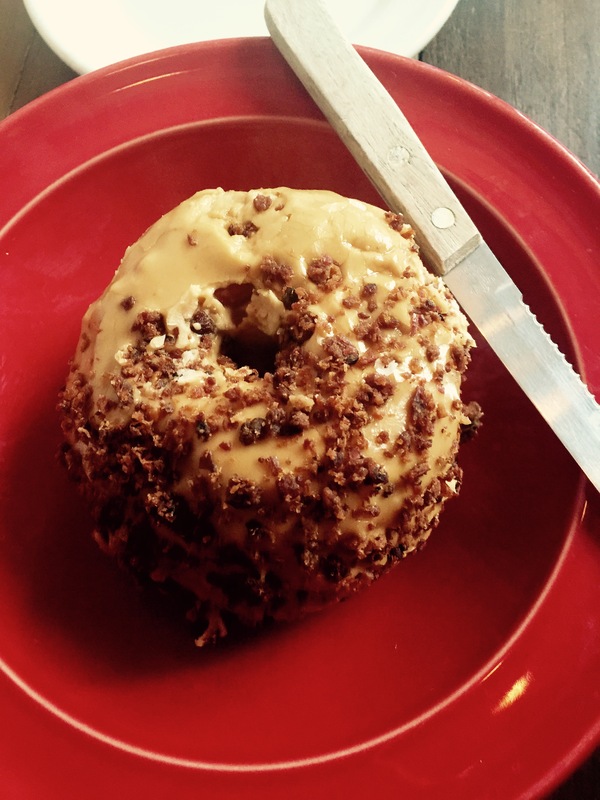 Verdict: Kept! The card said boyfriend, but they sent me the skinnies. 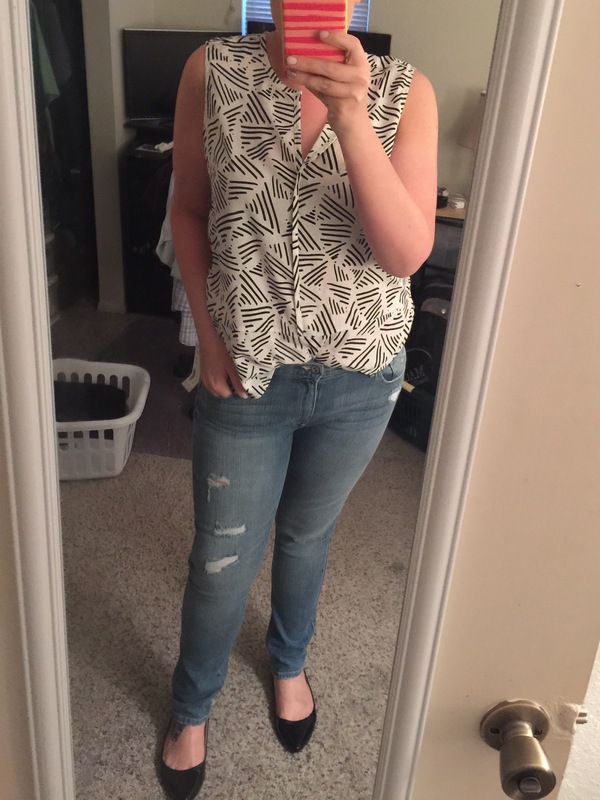 If these had actually been boyfriend jeans I would have been tempted to keep them. 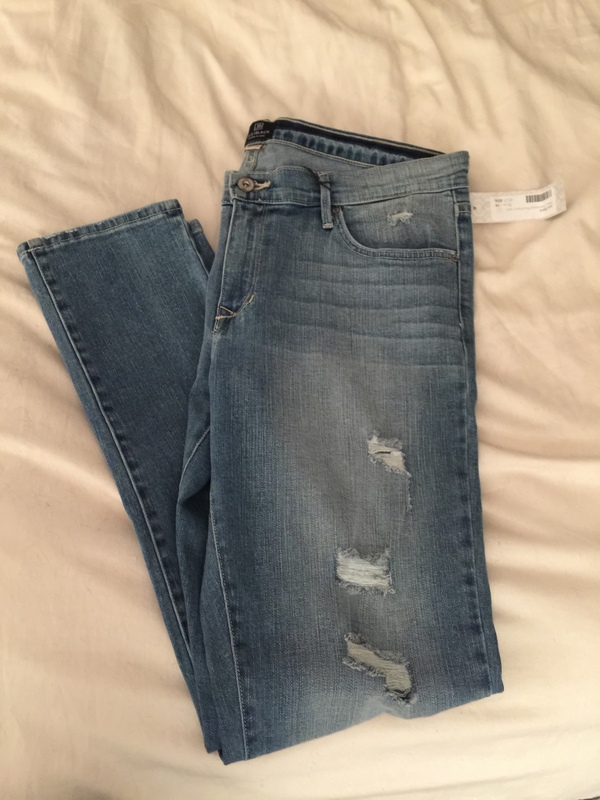 My stylist noticed I pinned a lot of distressed denim which is why she sent these, but alas I already own 2 pairs of similarly styled jeans.They were also a tiny bit big and I had a feeling I would end up with major booty sag by the end of the day. Verdict: Sent Back. 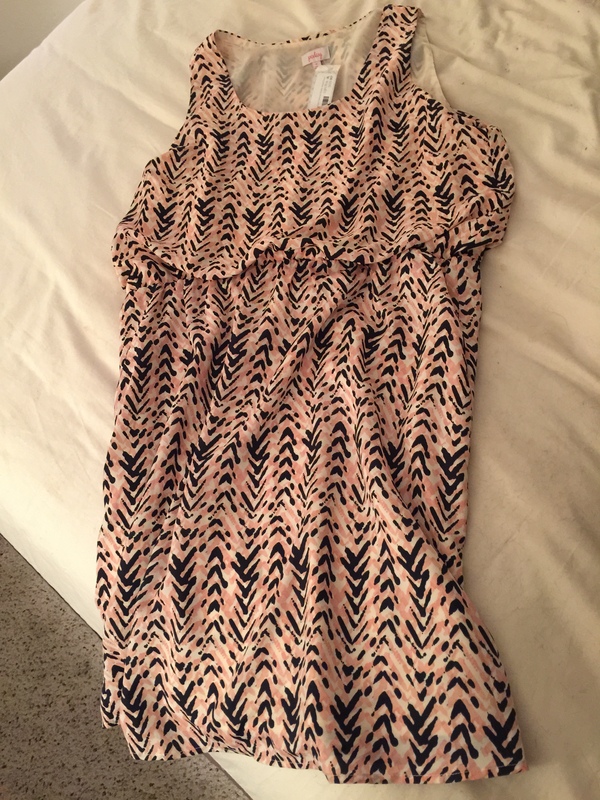 Something about the pattern on this shirt bothered me. It seemed kind of 80’s (and not in a good way). The cut was ok- although it was a tad big. I just couldn’t justify the price for something I didn’t love. 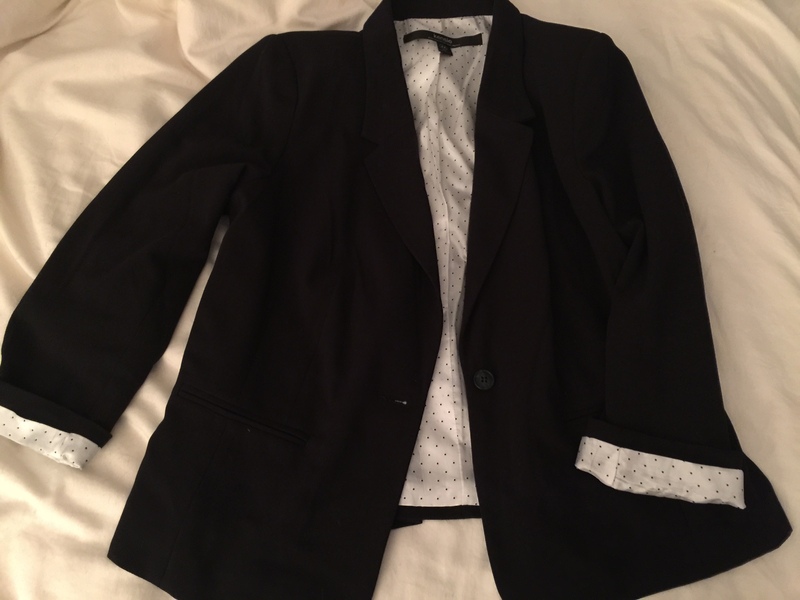 There are no words to express my love for this blazer! Perfect sleeve length, hits me in the perfect spot, and don’t you just love that polka dot lining? Also the fabric was the perfect weight and has a little bit of give which is always nice in a jacket. I was thisclose to sending it back because I really needed a L not an XL. But decided its a solid staple and I love it enough to pay for alterations down the line. Verdict: Kept! 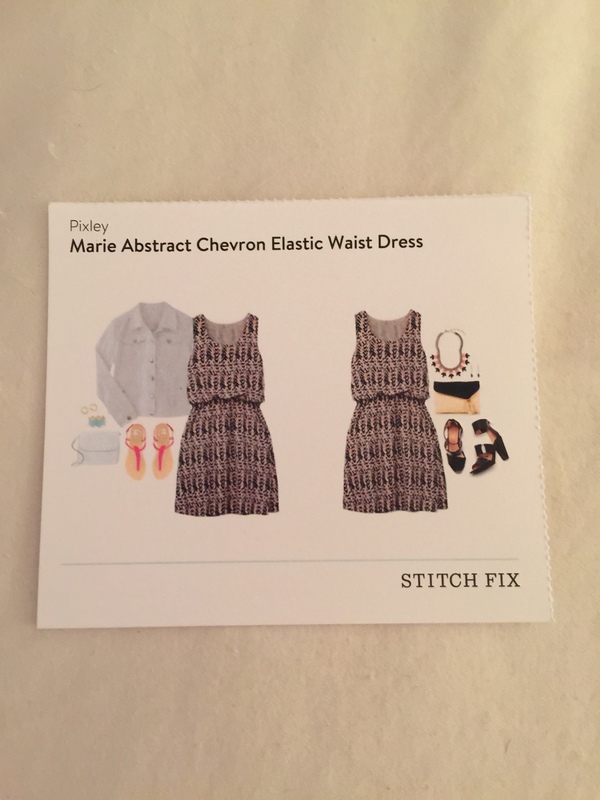 Overall I had a blast with Stitch Fix and can’t wait for my next box. I don’t think my stylist 100% got my style and I was a little bummed by the overall lack of color, but I have made some tweaks to my profile and hope they are a little closer to the mark on the next fix! 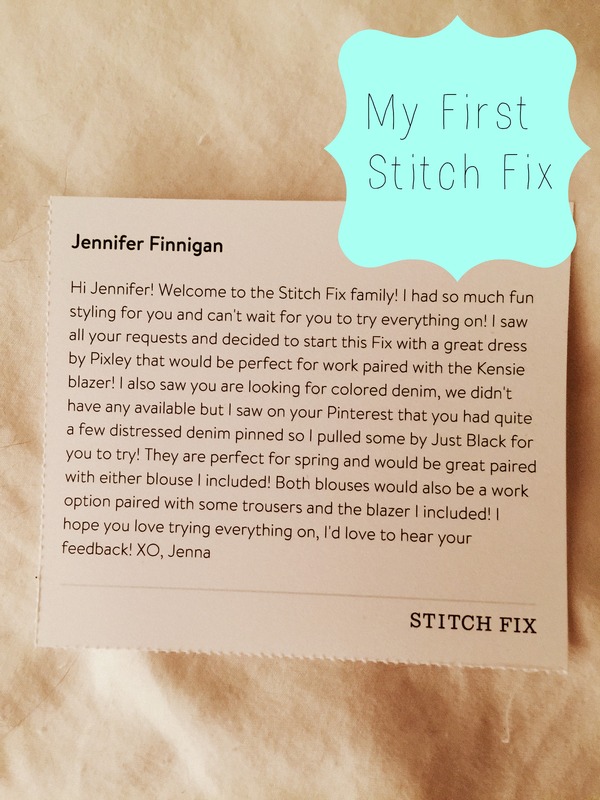 Want to give Stitch Fix a go? Use my referral link here.